In 1996, a tragic accident occurred on a soccer field at Northeast Park in the Park Ridge Recreation and Park District in Illinois. After a short rain delay in the game, the skies started clearing and a referee decided to resume play. A rogue lightning bolt, referred to as a "Bolt Out of the Blue", struck John Scott Wade, a 20-year-old college student, as he refereed a youth soccer match. Bystander CPR and quick medical attention by the Fire and Rescue services failed to save him. It is difficult to obtain accurate statistics on lightning injuries and fatalities since a systematic compilation of information on lightning casualties does not exist in this country. However, many case histories show heart damage, as well as inflated lungs and brain damage. Loss of consciousness, amnesia, paralysis, and burns are reported by many who have survived lightning strikes. Furthermore, deaths and injuries to livestock and other animals, thousands of forest and brush fires, as well as millions of dollars in damage to buildings, communications systems, power lines, and electrical systems are also the result of lightning. The purpose of this article is to educate Aquatic and Recreation facility managers and operators on the need to pre-plan for thunder and lightning storm emergencies and to educate their employees and patrons on basic safety and survival skills. The key ingredient that defines a thunderstorm is lightning. Since lightning creates thunder, a storm with lightning is called a thunderstorm. Lightning causes thunder. Therefore, anytime thunder can be heard, the danger of lightning is real, whether you can see it or not. Lightning is the visible vault of electrical ions from cloud to cloud, and cloud to earth. When storm clouds gather, violent air currents separate ever-present electrical charges. Lightning's compelling objective is to complete a path to the opposite charge in the cloud or earth. The path of a cloud to ground lightning strike is not completed by hitting the top of a house, building or tree, but must continue until it reaches earth. An object is struck because it is a better conductor than air and offers a better path to the ground. However, since the object struck is not an adequate conductor, heat is generated, resulting in fire or explosive damage. Although the flash of lightning and resulting thunder occur at essentially the same time, light travels at 186,000 miles in a second, almost a million times the speed of sound. Sound travels at the relatively snail pace of one-fifth of a mile in the same time. Thus the flash, if not obscured by clouds, is seen before the thunder is heard. By counting the seconds between the flash and the thunder and dividing by "5", an estimate of the distance to the strike (in miles) can be made. There is no moving away from lightning, at least not within the limits of the United States. All states have electrical storms, some more often, some more severe than others. The average number for any given area is 40 storms yearly. 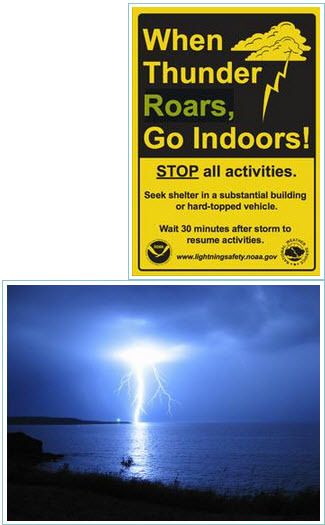 More specifically, there are from 40 to 80 lightning strikes per year within the average square mile in the U.S. According to the National Oceanic and Atmospheric Administration, lightning kills 55% more Americans than tornadoes and 41% more than hurricanes and floods combined. Lightning causes a total loss to homes and other structures of 15 - 20 million dollars each year. The U.S. Department of Agriculture estimates that lightning causes over 80% of all accidental livestock deaths. Lightning moves about 30,000 times as fast as a bullet. Lightning is a tremendously powerful force and may contain 100 million volts and 200,000 amperes -- thousands of times as much power as in an electric house current. Thunder and Lightning Storms Place Patrons and Employees At Risk! According to Ron Holle, a meteorologist at the National Severe Storms Laboratory in Norman, OK, one of the most dangerous situations for lightning is a "Bolt Out of the Blue". A B.O.B. can occur before or after a thunderstorm occurs, and gets its name because people may not even know a thunderstorm is forming. Work or play in open fields. Working on heavy farm or road equipment. Repairing or using electrical appliances. For lifeguards and aquatic facility operators and managers, protecting people on the beach and around pools from lightning is a difficult job since the largest number of lightning deaths come on or near the water. It is critical that facility managers anticipate the effects of adverse weather and take appropriate steps to protect their patrons' and employees' safety and the facility's valuable assets. Failure to do so may result in property damage, personal injury, and legal liability, which could have been avoided by the practice of preventive risk management techniques. Aquatic facility managers have a duty of "due care" to their patrons and employees. This legal term means that affirmative measures must be taken, when and where it is reasonable to do so, including appropriate measures to deal with the predictable effects of adverse weather conditions. It is not required that every conceivable preventive measure or precaution be taken, only what the reasonable manager would do under similar circumstances. Facility operators are not legally obligated to be the insurers of their patrons' safety, but neither are they entitled to be oblivious to it. 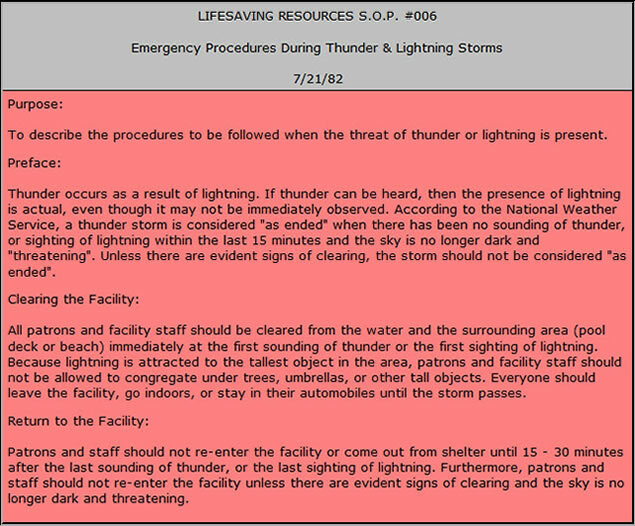 Therefore, we encourage all aquatic facility and recreation facility operators and managers to develop or adopt Standard Operating Procedures on Thunder and Lightning Emergency Procedures in order to educate their employees and patrons about proper evacuation procedures and personal survival skills in the event of a thunder and lightning storm. In 1982, while employed as the Director of Safety Services for the American Red Cross in Houston, TX, I received numerous requests from Lifeguards, Water Safety Instructors, and Aquatic Facility Managers and Operators concerning the threat posed by lightning to patrons and staff participating in activities in and around the water. As a result of these concerns, we initiated a research project for the purpose of developing a Standard Operating Procedure (SOP) which could be advocated to all Aquatic Safety and Recreation personnel on Emergency Procedures During Thunder and Lighting Storms. The following is the SOP which was developed as a result of my research into this subject. The question often rises about whether or not these same procedures need to be followed during a thunder and lightning storm when operating an indoor facility. It is almost impossible to totally protect a facility's electricity network from the damaging impact of lightning strikes. A facility's lightning protection system is designed to control the current provided by a lightning strike through a specific conductive path, thereby eliminating the chance of fire or explosion within non-conductive parts of the protected building. Lightning protection does not prevent a strike, but provides a safe path for the dangerous current to follow to ground. According to the American Red Cross, telephone lines and metal pipes can conduct electricity and the use of telephones or any electrical appliances should be avoided during a thunder and lightning storm. They also advise to avoid taking a bath or shower, or running water for any other purpose. Based on this information, we advocate that the same principles that pertain to outdoor aquatic and recreation facilities should be followed for indoor facilities as well. If indoors during a thunder and lightning storm, avoid water! Stay away from open doors and windows. Hang up the telephone and take off headsets, because lightning may strike electric and phone lines and induce shocks. Turn off and stay away from appliances, computers, television sets, power tools, etc. Stay inside until the storm is over! Aquatic and Recreation facility managers must make every effort to safeguard their patrons and employees in the event of a thunder and lightning storm at their facility. Whether a lightning prediction computer system or a human detection system is used, management must pre-plan warning and evacuation procedures for their patrons and employees. All personnel must be advised to take shelter immediately at the first detection of thunder or lightning. We encourage all Aquatic and Recreation facilities to develop a comprehensive Standard Operating Procedure manual and to train their employees in emergency management procedures, similar to those indicated within our SOP for Thunder and Lightning Storm procedures. 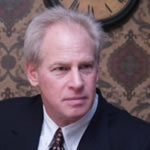 "When Lightning Strikes" by Gary M. Crist, JD. Golf Course Management (April 1996). "Before Lightning Strikes". American Red Cross, National Headquarters News. "Lightning Facts". Advanced Lightning Technology, Inc.
"Lightning Protection Systems". Advanced Lightning Technology. Inc.
"Stay Safe In the Storm". Far North Queensland Electricity Corporation Limited (January 29, 1998). "Severe Thunderstorms". The Weather Channel (1998). "The Lightning Primer". Lightning & Atmospheric Research at the GHCC. NASA (January 8, 1998).